South Korea is the world's fifth largest importer of oil. A lot of motorists in the nation are suffering from the soaring oil pirces. 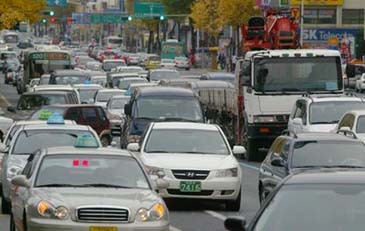 The continuing increase in oil prices is indeed a shock to the lifestyle of many Koreans and other consumers worldwide. To recover, alternatives must be developed, and take root in our lifestyles as consumers. Oil prices reached to $130 a barrel, and continuous to increase. The supply of oil is not increasing, and available sources could not cope with the hungry demands of developing industries in growing economies all over the world. China has been particularly energy hungry, due to the very high economic growth. Experts have long published their forecasts about the continuing increase in oil prices. But what has been the response of our public officials and consumers? In many countries, various sectors in the transport industry, such as airlines, shipping, delivery trucks and bus routes were forced to reduce or change operations to save fuel and energy costs. At the same time, the oil price shock is a constraint on economic growth in many industries. With recession, many workers are in danger of losing jobs from enterprises which could not cope or compete. It is important for societies, led by governments and consumers to develop alternative lifestyles which could reduce the demand for energy from oil. The fundamental solution to the high price of oil is to develop new sources of energy. The world supply oil is limited, and which are all drying out. Thus, experts anticipate a continuing increase in oil prices. This means Increasing a rise in the cost of production and delivery of goods and services, causing inflation, which threatens economic growth in many countries. But there is still time to prepare. We need to develop alternative to oil as soon as possible. Investments are needed to develop alternative energy sources such as solar energy, biofuels and hydrogen energy. Developing these new sources of energy requires both national and private sector coordination, through allocations in investment for research and development. As an international issue, collaboration with other countries to develop energy projects is needed, especially in sharing and developing energy technology. Government and the public, including ourselves who are consumers must get our plans and responses together in a coordinated manner, to adequately respond to the oil price shocks.